One day during his practice at Madison Square Garden, officials from the New York Rangers, a team in the National Hockey League, were impressed by Art’s play and asked him to try out for their affiliate in the Eastern Hockey League the New York Rovers. 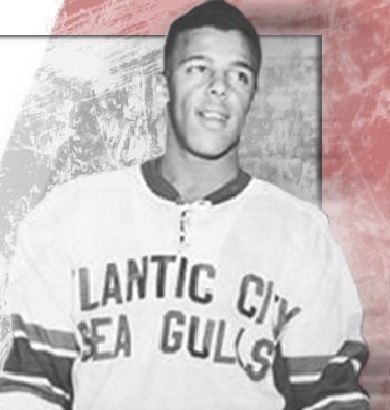 Since the Rovers were out of town for a week, Art went to play for the Atlantic City Sea Gulls and solidified his spot on the roster, making him the first African American player to sign an NHL contract. Hockey took Art all over the east coast, playing for the Atlantic City Sea Gulls, New Haven Tomahawks, Boston Olympics, Johnstown Jets, Washington Lions and finally the Philadelphia Ramblers. Unfortunately, his playing career came to an end in 1958 after he broke his femur. Art and his wife Dorothie made a life for themselves in Atlantic City and decided to stay there. During his retirement, the Sea Skate Ice Pavilion was built on the boardwalk and Art started a hockey program at the facility. Recognizing that only white kids were participating, he decided to start the Art Dorrington Ice Hockey Foundation (ADIHF) – a program that got African American kids involved in hockey while also integrating an educational component to build character and develop life skills. Three years after he started the foundation, Art underwent a hip replacement and the hospital recommended that he complete his physical therapy at Bacharach. He took their advice and went to Bacharach’s satellite facility in Brigantine – a decision he is incredibly happy that he made. Since his hip replacement, Art has needed rehabilitation for several other illnesses and injuries, and each time, he has pushed to receive his physical therapy at Bacharach – whether it is outpatient services at the Brigantine facility or inpatient services at the main campus in Pomona. Seeing the success her father had at Bacharach, Art’s daughter Judah has also received rehab at Bacharach and wouldn’t want to go anywhere else. Thanks to Bacharach, Art is still the driving force of the ADIHF, which is celebrating its 20-year anniversary next year. Even though he has been threatening to retire for the past three years, he is still the president of the foundation and oversees all operations with the help of Judah and the ADIHF board and staff.